It began when he was a child in Saskatchewan. His mother, who played guitar in an old time dance band, took Ed with her to dances. They hitched up a team of horses, wrapped the instruments in blankets to keep them warm and away they went. His uncles played fiddle and guitar. His mother got him his first guitar. It was hanging on the wall in his uncle’s house. Ed would stroke the strings. He always asked for it. Finally his uncle just gave it to him. His mother open tuned it, showed him how to play the first three chords, and gave him a butter knife to slide along the strings. He had his first slide guitar. 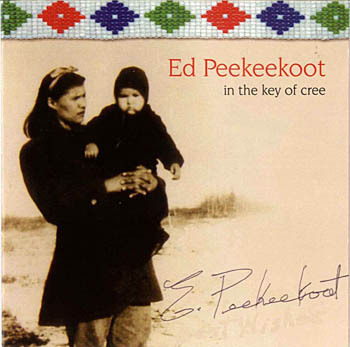 When Ed was sixteen his grandfather, hoping to find opportunities for the family, moved them from the Ahtahkakoop Cree reserve in Saskatchewan to the small town of Clearwater in B.C. Ed went to work in a lumber mill there. His uncle had already made him aware there was another guitar player he should listen to, Chet Atkins. Through Chet Atkins Ed was introduced to classical guitar, jazz and pop. He was fascinated with Atkins’ style which “sounded like two guys playing.” With his very first paycheque from the mill, Ed headed for Kamloops to a music store where he bought an electric guitar. “ It was do or die.” Ed remembers, of his decision to follow Chet Atkins’ finger-picking style. Ed joined The Trophy Mountain Boys, a Clearwater band which played for weddings, anniversaries, and fund raisers at the Elks or Moose Halls. Band leader, Davy Davison, an accordion player, took Ed under his wing, like an older brother, Ed says. The band had a bass player and a drummer. Ed played lead guitar and began singing then. Clearwater residents who heard the band still speak with affection and admiration of Ed’s gentle personality and exceptional talent. As well as having a play list suitable for various occasions, the band had to be adaptable. During one snowmobile dance a fight broke out at the back of the hall. Tables were overturned. As the fracas made its way toward the stage, musicians planned how to protect their instruments should the combatants reach them. Fortunately calm was restored. After ten years Ed married and moved to Vancouver. There he got his own country-style band going. They became part of the musical scene in downtown Vancouver. It was an eye-opener for a young guy from Clearwater. Granville St. was a lot different from the Elk’s Hall back home. “ There was nobody there who was normal.”, Ed recalls. For most of his career, Ed has performed as part of the mainstream country music community. Recently he’s reclaimed his First Nations Cree heritage. 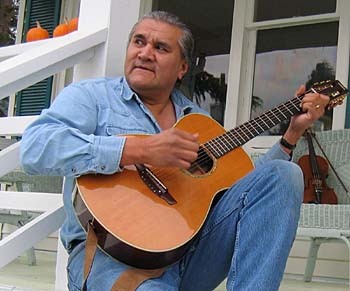 His CD “In The Key Of Cree” released in 2006 was nominated in 2008 for an Aboriginal People’s Choice Award for its Cree world view. Ed’s music, as well as his life, is an example of the influence of cultures enriching each other. He traces the intertwined effect of previous generations and races on country music and remembers country music’s roots. One of his proudest moments was playing ‘Freight Train’ for its composer, Elizabeth Cotton, at a workshop in Puget Sound. Cotton, then in her ‘90s, praised his performance of her classic song. From his home in Crofton, B.C. Ed continues his musical journey. May 28-30, 2010, he will be appearing at the Canadian Rockies Cowboy Festival in Nordegg, Alberta. August 6-7th, he will be at the Prince Albert Exhibition and Summer Fair in Prince Albert, Saskatchewan.